I keep telling myself that we are all good at something, but not other things. It seems one of the things I am not good at is a puzzle cache !! We seem to have a tremendous amount of them around our way and since we started caching back in late August 2014, I have occasionally peeped at them but it is only in recent weeks that I have started to look more seriously at them. Not that that has done much good. I have even gone as far as printing many of them out so I can peruse them at my leisure, hoping that my brainwaves would kick in and help me solve them. I’m still waiting……. When I am trying to remember something, or work a problem out, I have often found myself coming-to in the middle of the night with the answer right in front of me. Not with these blooming puzzle caches though. We have a series of puzzles set quite local to us – 26 in all – the letters of the alphabet by ‘Uncle E’. Try as I might, I cannot get into his brain and see how he is working them. Perhaps I am being a trite thick, but my trusty iPad nearly got thrown out the window the other night as I lay in bed trying to solve “F” – I can think of lots of things F could stand for but in relation to the Eternal City, the Greek Gods who are probably Roman Gods; Zeus who is probably Jupiter or even Jove………………… not the sort of thing to go to sleep on. We have collected one of Uncle E’s puzzle caches recently – Tracy GC16RVB – but even then we didn’t actually solve the puzzle ourselves! I mentioned the puzzle to our friends the GeoVanns and Mrs. GV eventually came up with the answer, although I must say she didn’t do it immediately so perhaps there is hope for us. I will not give up; at the moment I won’t even email Uncle E for some hints as suggested by another cacher. I can be quite determined when I want to be and I am taking a folder of puzzles away with me to ponder on in my spare moments (hope I don’t have too many of those). I might even sidle up to Mrs. Geovann if she isn’t too busy and show her a few……… What is it they say “two heads are better than one” and Cockrobbinn is no bloomin’ use – he won’t even look at them! In the meantime, on Saturday night my inbox started beeping and didn’t stop until 26 (yes, twenty-six) brand new geocaches dropped in, and the lovely thing about them was that they were fairly local to me. Hampshire Drive Bys – all 26 with parking nearby; no fences nor hedges need be clambered over – a circuit of about 10 miles. This was one series meant for us and Sunday morning dawned bright and dry so we headed out nice and early determined to have a lovely caching day. We’ve never been ones for chasing down FTFs and didn’t expect to be first for these (on most of them we were second to find) but we did bump into ikran3 who was finishing the series having started in the dark on Saturday night and was FTF for quite a few of the caches (I’m Hiding I’m Hiding being FTF for the rest). We were going in opposite directions (for once we had started at #1 and were working our way to #26) whilst ikran3 was going in the other direction. We exchanged notes, as one does being a geocacher, and she mentioned that whilst she had found #9, she hadn’t been able to open it. With a bit of trepidation we approached #9 and realized why she hadn’t been able to get in. Cockrobbinn tried for quite a while but had to give up, then I tried but it seemed stuck fast. I then grabbed my leather gloves from the car which gave me a much better grip and sure enough, we managed to get into #9. When logging the cache later in the day, we noticed that ikran3 had decided to return to #9 with the hope that someone had eased the opening of the container, which of course we had. Our good deed for the day ! Having never done a Drive By series, we were delighted with this route. 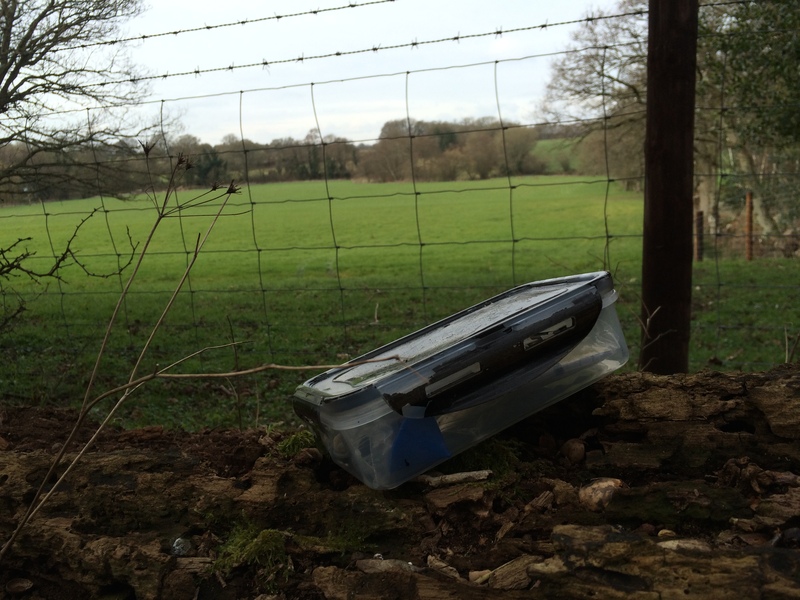 Most of the ten miles were down little country lanes with tiny pull-ins where a cache was hidden. Sometimes we were parked within a couple of metres of the cache and could almost lean out of the car door to grab it; although some took a bit of working out as to where they were hidden. Some were easy – exactly where the clue stated but some were very craftily and very niftily hidden. The cache owner, Fennyflip, had really taken a lot of time and care with this series and it was a pleasure to cover the ten miles or so finding them. There were some beautiful views along the way, and we managed to add one extra find towards the end of the series, County Boundary GC1N32Y. However, #5 eluded us, as well as it did the first two cachers, but I must give the cache owner Fennyflip his due as he has already been out to check the missing cache (Sunday 28th) and it was found kicked in amongst leaves a little way from where it was supposed to be. Perhaps tomorrow we will collect the elusive #5 as we know exactly where it should be hidden. 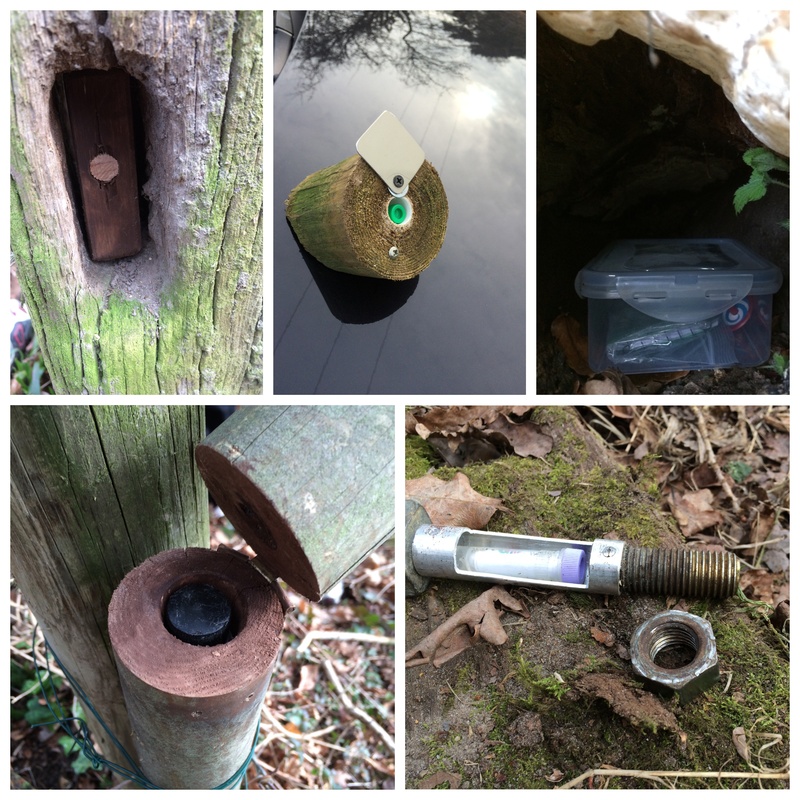 An excellent series of caches and many thanks to Fennyflip for taking the time and trouble to set them all up. Cockrobbinn and I thoroughly enjoyed the experience of driving to each cache as we normally do a lot of walking; it made a lovely change. I don’t want to give away too many spoilers for this series, but give below a few pictures of some of the favourite caches from the series. This expedition took place on Sunday 28th February 2015 and brought our total finds to 594. BodRobbinn – our travelling charger has now achieved an amazing 12452 miles. This entry was posted in Caching, DNFs, Drive Bys, Geocaching, Hampshire and tagged Caching, Drive Bys, Geocaching, Hampshire, Hobbies, Puzzle Caches. Bookmark the permalink. Some interesting caches for a drive by series. I have been solving puzzles during the winter months – I am writing a post about them, I have managed to solve 10 so far but only easy ones. The drive by series sounds like fun there is one in Dorset which starts not too far away from me, I hope to tackle it in the summer. Look forward to reading your post re puzzles. I’ve managed to solve a few more but, wow, some are mind-blenders!